There are some great magazines and periodicals available offering an assortment of articles and stories about Scotland! Whether you like reading about Scotland's history, natural beauty, current events, environmental issues, culture, music, or something else, find these magazines at your local library, store, or visit their website for a subscription. For more than 40 years, The Highlander has connected fellow Scots to their rich heritage in a way no other magazine does: stories of Scotland's stirring history, from epic clan struggles and folklore to profiles of memorable Scots, plus genealogy, coverage of North American Scottish activities and more. Scottish Life is a lively and entertaining blend of everything you love about Scotland. It's your passport to Scotland's enchanting destinations, history, culture, people and events... so beautifully presented and so full of useful information, you won't know whether to keep it on your coffee table or pack it with you on your next trip. Enjoy 80 pages of fascinating articles, informative columns and truly stunning photos, all elegantly designed and printed in full color on high-quality glossy paper. It's as magnificent as Scotland itself. Celtic Life International is a superb publication that seeks to highlight Celtic cultures of each type from across Europe and merge them all together into this one magazine. You can read everything from the latest news on Celtic fashion, history, culture, interviews with celebrities, travel, tourism, new recipes from renowned chefs, and articles from guest writers across the globe. Visit their site to sign up for a subscription today! 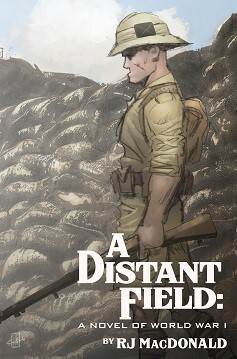 A Distant Field is the first novel in a new series. It begins with the torpedoing of the RMS Lusitania off the Irish coast in 1915. On board Stuart and Ross McReynolds struggle for their lives as the ship rapidly sinks and only survive thanks to four young Irishmen who row to their rescue. Together, with a Canadian and a young English officer, they go on to join the Seaforth Highlanders, the remotest of all Scottish regiments in the British Army. On the way Stuart falls deeply in love with Nell, a friend of his cousin who lives in a small coastal fishing village on the east coast of Scotland. Their initial training is hurried, and they set off for France, only to become ensnared in the Quintinshill Disaster, the worst train crash in British history, which kills or wounds hundreds of Scottish soldiers. After recuperating, they receive new orders to sail for Gallipoli, where they face their baptism of fire and must learn to fight and survive under the blazing Aegean sun against Turkish soldiers, Jihad-sworn to push them back into the sea. The author, RJ MacDonald, lives in the East Neuk of Fife, Scotland. He left Scotland as a teenager and spent sixteen years in America enlisting in the US Marines Reserves after graduating from UC Berkeley. He returned to Scotland to complete two masters degrees and was commissioned into the Royal Air Force Reserves. A veteran of Iraq and Libya, he now serves on a volunteer lifeboat, tasked with a 24/7 all-weather maritime search and rescue role in some of the world's roughest seas. For more details, please visit www.rjmacdonald.scot.